Not a Simpson to be found on either roster as the Phantoms head to Springfield to begin their road-trip weekend tonight. Whether they want to or not, the Lehigh Valley Phantoms will certainly be finding out a lot more about themselves on Friday night when they skate against the winless Springfield Falcons (farm club of the Arizona Coyotes) in southwestern Massachusetts. To get straight to the point, the Falcons, who have failed to gain even a single point in their first two games of this new season, are just not one of the stronger teams in the American Hockey League’s Eastern Conference this time around. In other words, Springfield are exactly the sort of team that Lehigh Valley need to defeat if the Phantoms are going to make the Calder Cup playoffs for the first time in seven years. It should be rather interesting to find out what the goaltending match-up will be at the MassMutual Center. The Phantoms’ well-traveled veteran netminder Jason LaBarbera, who has been with the Philadelphia Flyers and getting paid at his NHL rate of $ 600,000 the past few days, returns to Lehigh Valley and is now on the clock at his AHL rate of $ 250,000 per season. But LaBarbera has been something less than dominant in his first two appearances for the Phantoms this fall (against Wilkes-Barre Scranton’s B team in the last exhibition and versus Syracuse in the season opener) and could give way to second-year pro Anthony Stolarz, the 2nd round pick (# 45) of the Philadelphia Flyers at the 2012 NHL Draft on Friday night. Meanwhile, the Springfield Falcons are carrying no fewer than four goaltenders on their AHL roster at this particular moment although two of them are soon likely to be assigned to the Rapid City Rush once the ECHL season gets started. Louis Domingue, the 23-year-old who appeared in seven NHL games (2.73 avg, .911 svpct) for the Arizona Coyotes last season, did not play in either of Springfield’s first two games despite being the most experienced at the highest level of North American pro hockey. 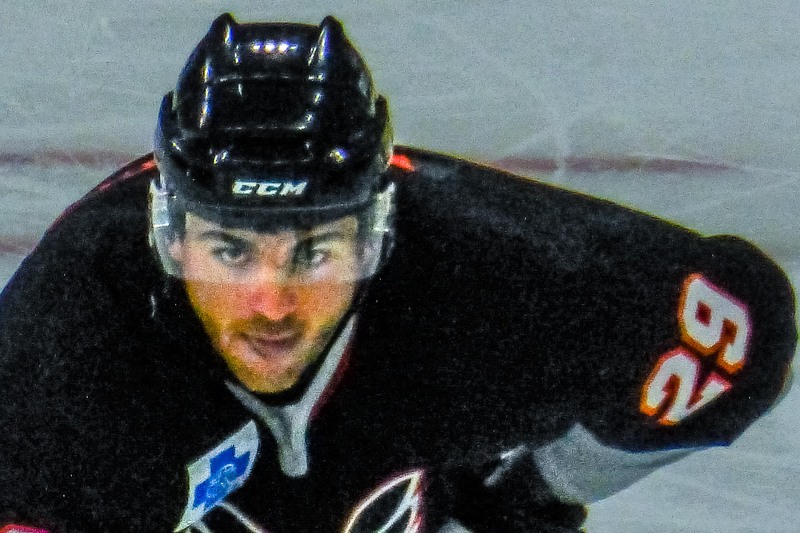 Domingue, who made 20 AHL appearances (2.68 avg, .908 svpct) for the Portland Pirates last season, had announced intentions to play in Europe but ultimately signed a new two-way contract with Arizona at the beginning of September. Marek Langhamer, the 21-year-old who is in his first year as a professional after graduating from the Canadian junior ranks, is the other alternative between the pipes; Langhamer was the starting goaltender for the Czech Republic at the 2014 IIHF World Junior Championships two winters ago and was teammates with Hershey Bears’ 19-year-old center Jakub Vrana (the 1st round pick of the Washington Capitals at the 2014 NHL Draft) as well as Wilkes-Barre Scranton Penguins center Dominik Simon (the 21-year-old who skated with Jaromir Jagr and Jakub Voracek on the senior Czech national team that finished fourth at the 2015 IIHF World Championships this past spring). No matter who winds up in net for the Falcons on Friday night, visiting Lehigh Vally are almost certain to face former Phantoms defenseman Steven Delisle, known as “Diesel” to some and as a virtual penalty machine to others. Lehigh Valley will also benefit from the fact that puck-moving defenseman Dylan Reese, the highly experienced 31-year-old from Harvard University who led all Portland Pirates blueliners in scoring last season with 40 points (10 goals) in 72 AHL games, is currently injured at the moment. Still, Phantoms forwards will have to contend with another pair of seasoned defensemen — Alex Grant, the free agent signing from the Binghamton Senators, and NHL veteran Derek Smith, the 30-year-old rearguard who spent last winter with SC Zurich in Switzerland — who are capable of generating offense. The proverbial Danger Man for the Springfield Falcons is free agent signing Dustin Jeffrey, who finished in a tie for seventh place in the AHL scoring race last season after totaling 64 points (25 goals) in 69 games for both the Utica Comets and the Bridgeport Sound Tigers. The 27-year-old pivot is tied for the Springfield team lead in scoring with three points (one goal) and leads all forwards with six shots on goal, as well. Jeffrey has been centering a line featuring the Falcons’ top two prospects (1st round pick Henrik Samuelsson and 2nd round pick Lucas Lessio), at least in terms of NHL Draft Status. Falcons rookie left wing Matthias Plachta, the 24-year-old import from reigning D.E.L. titlist Adler Mannheim who has skated for Germany at the annual IIHF World Championships the past two seasons (13 ga, 3 go, 0 as) now, stands second among all Springfield forwards with five shots on goal but is still searching for his first AHL point after his first two AHL games; Plachta, whose father was a Poland national team winger that spent the overwhelming majority of his career in the German first division, certainly has the requisite size (6’2″ 218 lbs) to play the more physical style of hockey found here in North America. Springfield’s new captain is Craig Cunningham, who scored 20+ goals for the Providence Bruins three straight years before spending most of his time in the NHL last season. The 25-year-old right wing appeared in a combined 51 NHL games (3 go, 7 pts, 4 pen, – 7 def) after dividing the 2014/15 campaign between the Boston Bruins and Arizona Coytoes. Fittingly enough, it was, indeed, the skipper Cunningham who scored the Falcons’ lone goal in their opening game loss at the hands of Hershey. The health of Lehigh Valley Phantoms captain Colin McDonald is thought to be in doubt which means that popular pugilist Jay Rosehill could very well make his 2015/16 AHL debut against the Springfield Falcons on Friday night. To review, the 30-year-old enforcer could not get a place in the Phantoms line-up for the opener against Syracuse because Lehigh Valley have an excess of “Veteran” players on the roster. However, should Rosie (6’3″ 215 lbs) lace up his skates on Friday it WOULD be interesting to see whether or not the visitors’ tough guy would go ahead and square off against the former Phantoms defenseman Delisle (6’6″ 225 lbs). The game Saturday at Casey Place is scheduled for 4PM in order to accommodate the evening’s college football action as Penn State faces off against Ohio State. The early start will probably mean that the alternate of whomever starts in goal tonight will get the start tomorrow–so both “Barbie” and “Stolie” should see action this weekend. Indeed we’re interested in finding out more about this team: They’ve only played one game in the past 11 days. The game will be available as part of the AHL-Live package ($100 for the “team away” package with your “early bird” discount until 10/16) or on the radio at AM-1470. An internet link is available on the Phantoms site, as well as via the IHeartRadio App. The AHL Live quality and consistency is suspect, I’m told. Please report back, anyone who decides to pony up. Not planning on having write-ups for away games, but many thanks to d.E. for the above–it’s more fun when you know what you’re cheering for! I haven’t heard of anyone heading to Wilkes Barre for Saturday, but will pass along as it comes. Side note: It is their home-opener, and there are seats available. SAVE THE DATE: I’m in the early stages of planning a group night at the Reading Royals if anyone is interested. No transportation, but group ticket rates and a presence for our Phantoms Phriends who are currently with the Royals. I’m looking at Friday, November 20. Alright, I did it. Soon after this post went up, I received a discount code from the Phantoms (AHLAWAY2015) which took an additional $20 off the early bird price. Every Phantoms away game for $80.00. I’ll let you know how it works out.